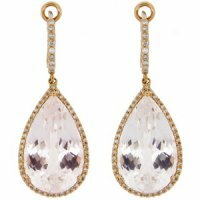 Enchanting Clear Topaz and Diamond Pendant Earrings. Diamond and Topaz Earrings. Pendant Earrings. Each of these enchanting earrings is delicately set with a large briolette cut Pear Shape Topaz within a simple single row of 46 small brilliant cut diamonds to a loop set with a further 9 small brilliant cut diamonds all set in a fine claw setting. The Pear Shapes measure approximately 18x11mm and weigh 24.80cts in total. There are 110 brilliant cut diamonds in total weighing 0.40cts. All set in 18 carat Rose Gold with post and clip fittings. Length 32mm Width 13mm. Stamped 750. 4.14 grams.of Topaz 24.80cts Diamonds 0.40cts. Rose Gold. 18ct. An Octagon Topaz and Diamond Dress Ring. 18ct Rose Gold.